In a sequence of colorful and amusing stories relating to his new neighbors, their animals, and the characters in the awesome mountain setting of western Montana's picturesque Bitterroot Valley, author Don Buelke of Victor, Montana, has written a book titled Critter Waythat literally and metaphorically takes the reader along on the life journey of a young veterinarian thrust by his new practice into a remote and unfamiliar environment. The book represents an expanded dimension of themes published by Stoneydale Press over the past 30 years, including books on outdoor recreation, regional histories, biographies and warm reminisces of life experiences in Montana and the Pacific Northwest. It is the first published work by Buelke, who recently retired from a long career as a veterinarian in the Bitterroot Valley. While the story of Critter Way is set in a fictional community of Pine Cone, Montana, it represents a continuum of tales reminiscent of those written by an English veterinarian a generation ago that evolved into the PBS television series "All Creatures Great and Small." 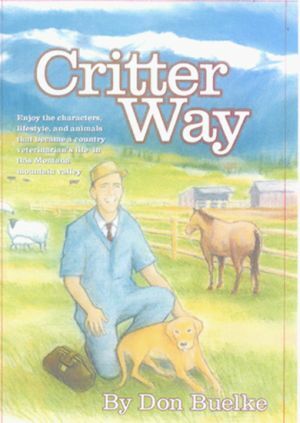 In Critter Way, Buelke tells the story of a young veterinarian with a few years' prior practice experience who has just completed a two-year stint in the Air Force and packed his family into their station wagon to move across the country to the Bitterroot Valley of Montana. It was the spring of 1970 and the young veterinarian was about to embark on an unknown future where he'd face austere conditions, cold weather, and a unique culture in a community locked in a time decades behind. "This isn't another `heart-string' story about a veterinarian heroically saving patients, or a `how-to' book on veterinary care. It's a book focused on rendering refreshing tales about engaging people involved in enticing situations," publisher Dale Burk of Stoneydale Press, said. "The author skillfully embroiders them onto a breathtaking tapestry of a time-locked Montana wilderness valley with their vernacular, customs, and down-to-earth personalities in a manner that will compel readers to relive the situations just as though they were there. It's an entertaining, lighthearted, and refreshing alternative to the self-help books, political diatribes, and social critiques filling bookstore shelves today. Anyone with an interest in animals, even young readers, will adore these delightful tales from the not too distant past." Critter Waystarts with the veterinarian's first emergency call, an unusual request to repair the broken leg of a canary whose owner was an aggressive, but softhearted lawyer. It wasn't long before the "line-shack" that served as his family's first abode compelled them to undertake a house-hunting adventure with a savvy old realtor who enlightened them about some of the cultural characteristics and simple values of the fascinating people in Pine Cone. When his little girls wanted a pony, he found himself dealing with an irascible old horse wrangler who gave him clues not only about horses, but about life in the Valley as well. Other anecdotes range from assisting a hardy stockman delivering a calf in a winter storm, to a spectacular trek with new friends into the vast wilderness outside this enchanted hamlet. The characters he encounters and the situations in which they become involved provide chapter after chapter of colorful reading, interspersed with heartwarming sagas of special animals and unique people. In every case, the characters and situations imbue an element of charm to the book. From the preface through the last sentence, this book compels readers to seriously await the author's next release. "Critter Way" was issued in 6x9-inch softcover format. It contains 160 pages, a number of illustrations by Sean Mallow of Stevensville, Montana, and a colorful cover design by Neal Wiegert of Missoula, Monana. 2007 Trade Paperback. This new book comes from an independent book store in the United States. Shipped quickly and we provide a USPS tracking number.